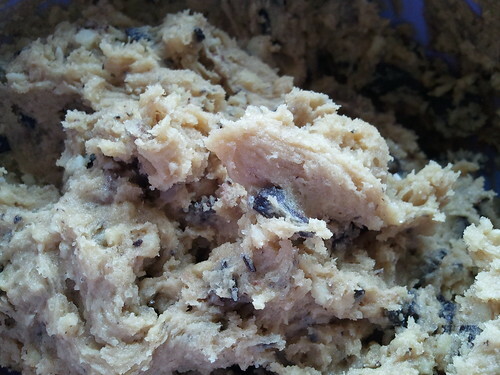 I had been thinking about baking some chocolate chip cookies for quite some time now, and after reading a post about choc chip cookies at stirandstitch’s blog I thought it was time to go ahead and bake some using this new recipe in stead of my go-to choc chip recipe that I have been using for years. 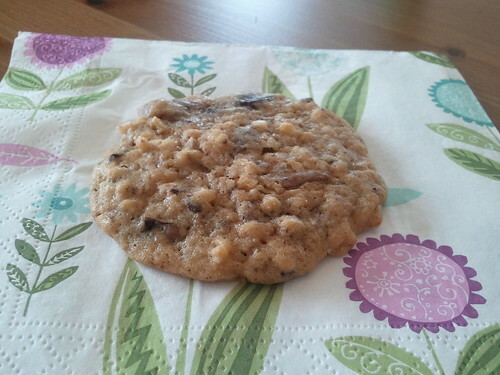 I had to change the recipe a bit because they didn’t have the sugar I wanted at the store – and I am wondering about the baking soda in the recipe ??? 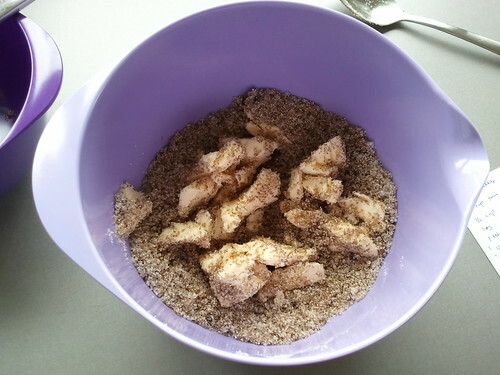 usually I would use baking powder, so I used 1 tsp of baking powder in stead. 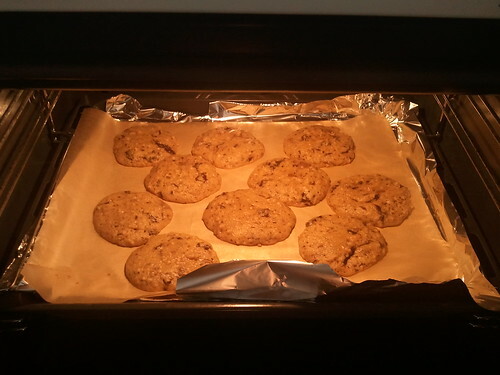 (You usually have to double the amount when using baking powder in stead of baking soda – baking powder is actually half baking soda and half the acidic ingredient that you need to activate the baking soda.) 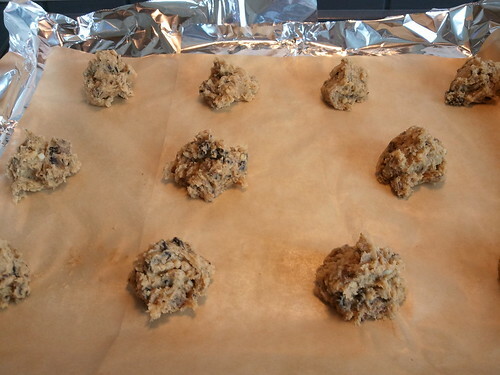 Since there was no buttermilk or other such acidic ingredient I thought it safe to substitute; the baking soda would probably fail in the cookies on it’s own anyway. Also, the eggs I had was size medium and they looked fairly small for medium eggs too so I had to use 2 eggs in stead of one. I also chose to use two thirds 70% dark chocolate and one third milk chocolate. 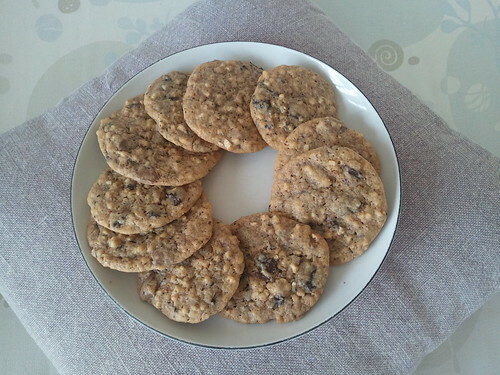 And lastly I used chopped almonds as a nutty ingredient. 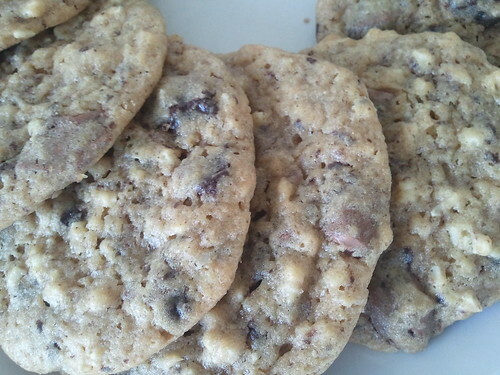 The photos do not make the cookies justice – they are darker and yummier to look at in real life. 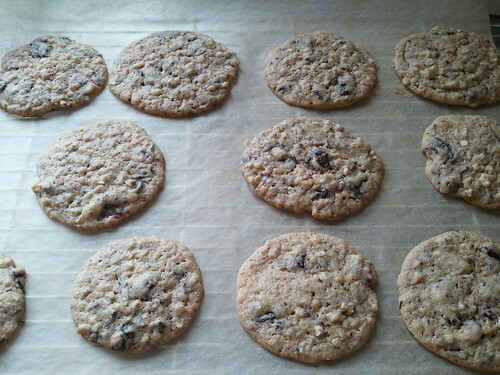 They were very yummy to eat;slightly crisp on the outside and lovely chewy on the inside – just like I like them. 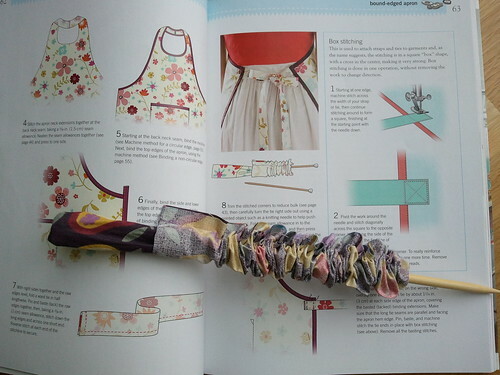 You might know this already, but I am trying to learn how to sew by following the workshops in the great book called ‘Sewing machine basics – A step by step course for first-time stitchers’. 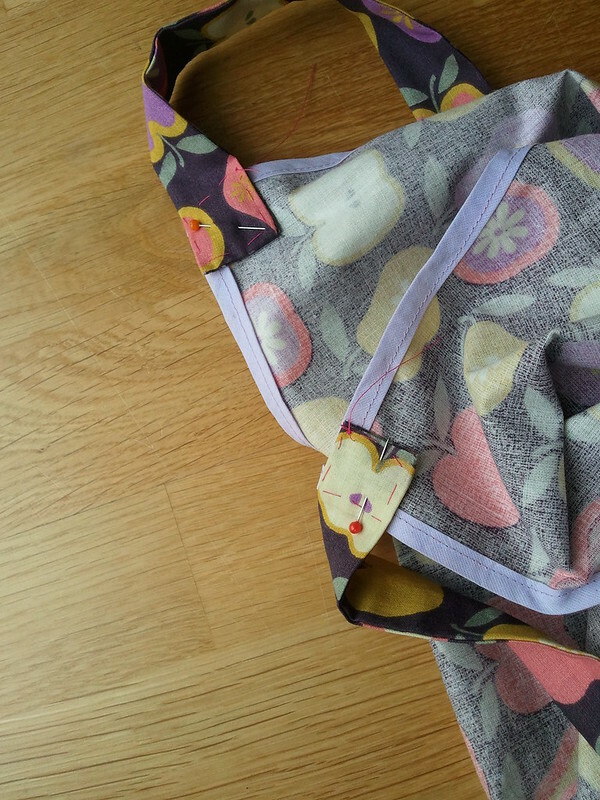 I decided some time ago to use the same felt for the bag as I used for the scarf that I sew in the 2nd workshop of the book, and I am also using the same fabric as I used for the apron that I just finished sewing on the 3rd workshop of the book. 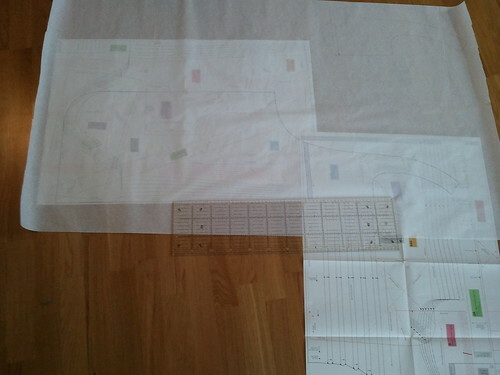 I think I am getting better at cutting in a nice neat line along the pattern paper. 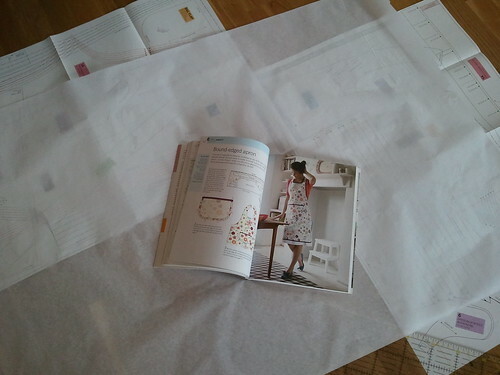 I am so very excited about this project. 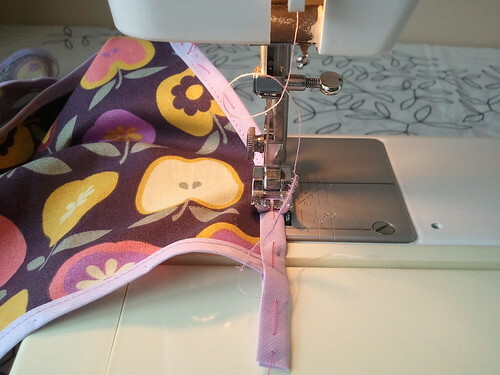 It feels like a real challenge to have to line a bag and sew so many pieces together, but I like a challenge and I can’t wait to start sewing. 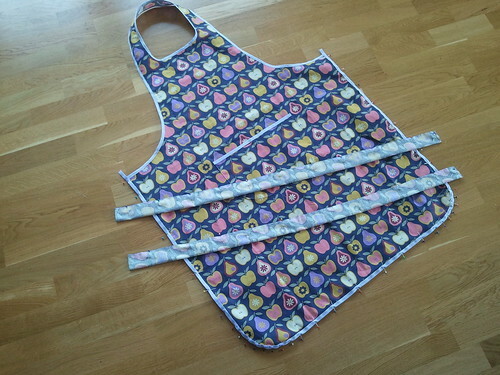 Bound-edged apron – a finished project! 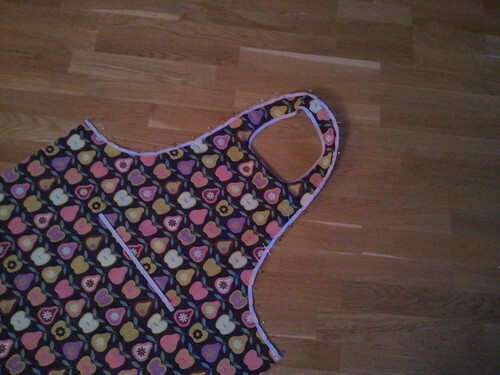 I have finished my 3rd learning-how-to-sew project, and I am happy with the result! 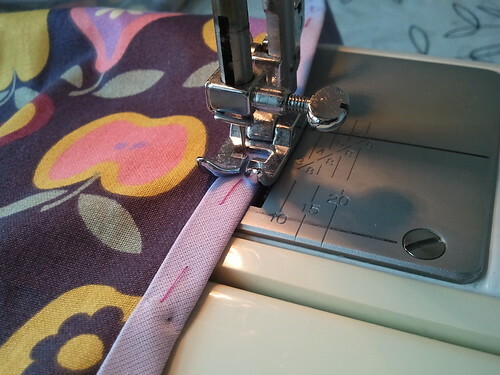 Last time I wrote about the apron project I had already sewn the ties, but still needed to turn them right side out and attach them to the apron. 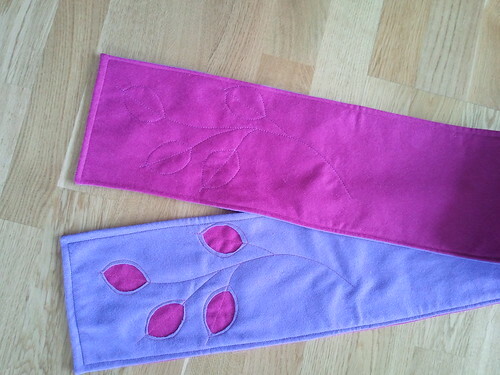 Then I pressed the ties and slip-stitched the ends shut. 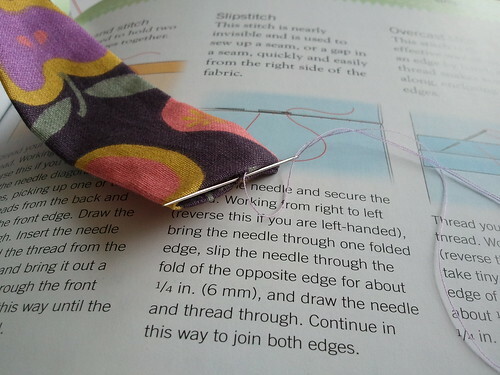 I am amazed… slip-stitching is like performing magic – you don’t see the stitches even though you are sewing from the outside! 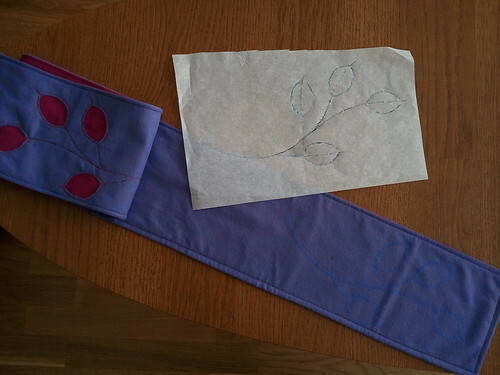 Attaching the ties was actually more difficult than I had expected. 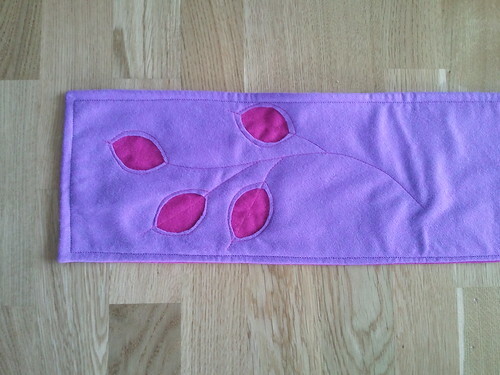 The box stitches was very difficult to make look nice, and this was my first try at doing it, so I guess I shouldn’t have expected too much, but I had hoped for a nicer box. 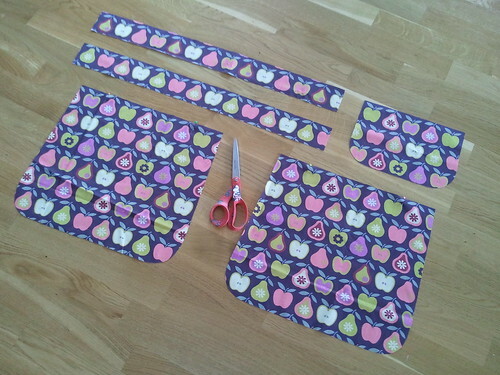 But I can’t complain about the overall finished result…. 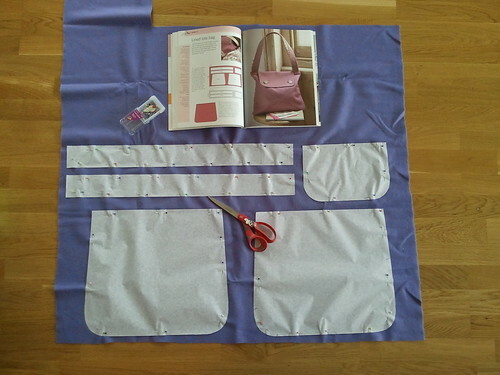 Next project is a bag, and I am really looking forward to the challenge. 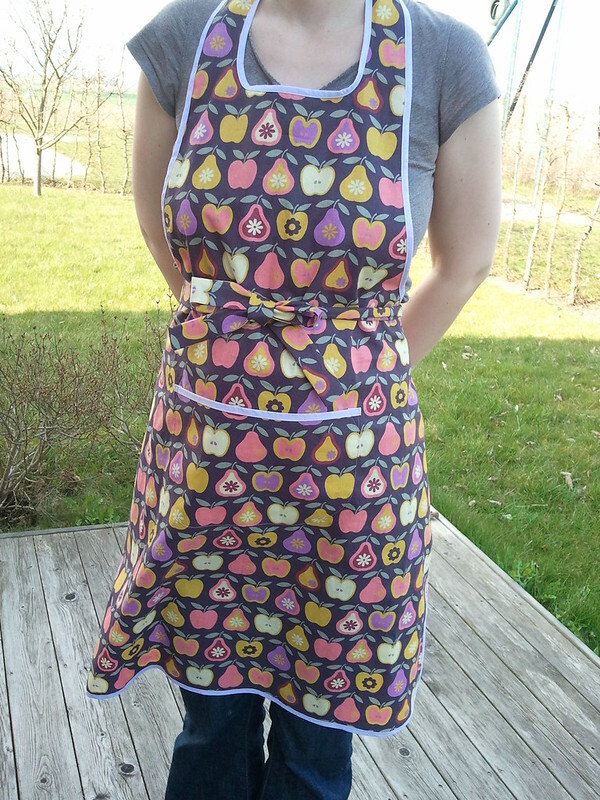 The apron isn’t quite finished yet, but It’s getting very close! I’ve bound all the edges, and it was maybe easier than I had thought it would be, but that’s just because I had thought it would be really difficult. 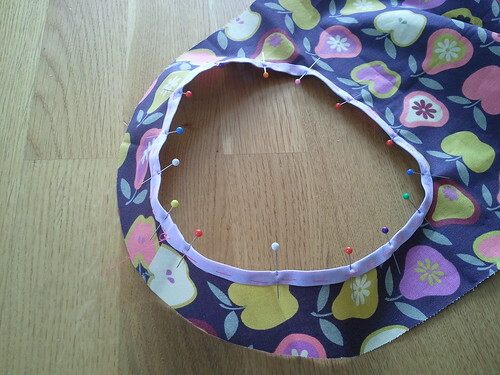 As you can see the result could be neater, but for a first try at binding a rounded edge I’m happy. 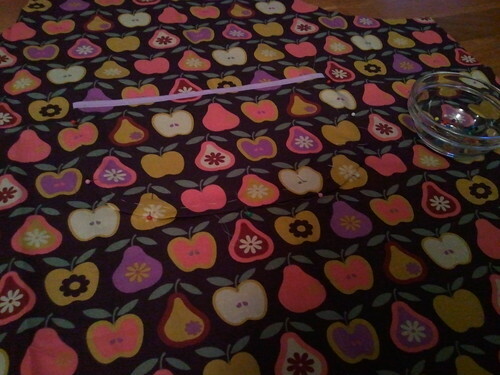 And then when I was so happy with my new discovery and thinking how great I’ve become at sewing . 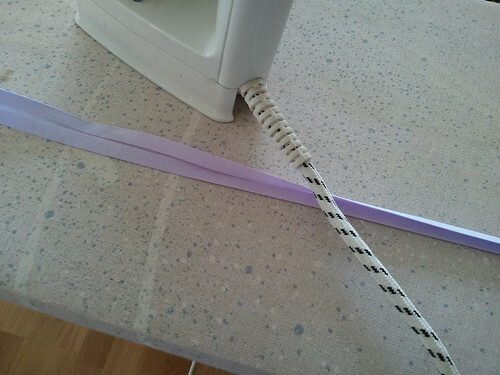 . . . . the thread broke! Ah well, I’m sure this happens for everybody sometimes, and I fixed it and continued and the result was fine. 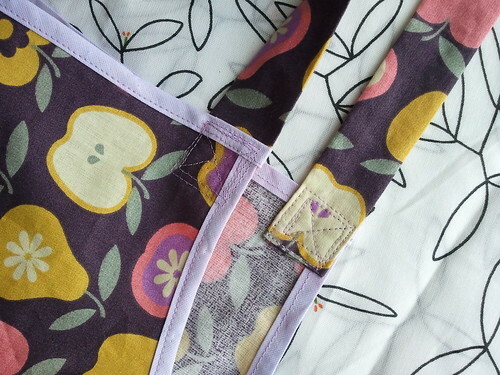 The apron project is all about learning to bind edges and apply pockets, so the apron has a nice big pocket with a bound edge plus the whole apron also has a bound edge too. 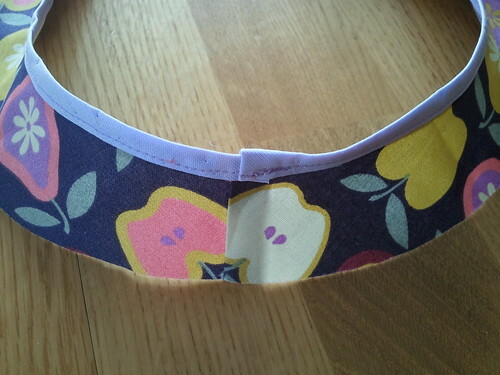 To make it even more challenging, the pocket has rounded corners! 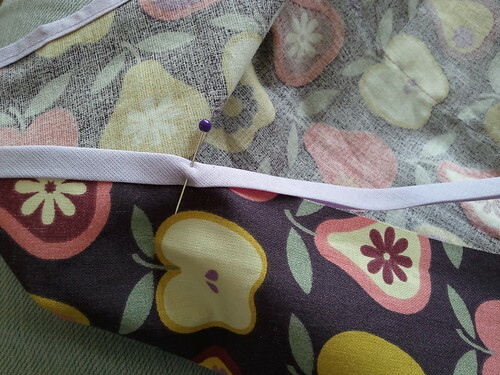 Baby girl went to sleep early yesterday, and husband was out for a work dinner, so I got my sewing kit out and started on giving the pocket a bound edge and then went on to apply it to the apron front. 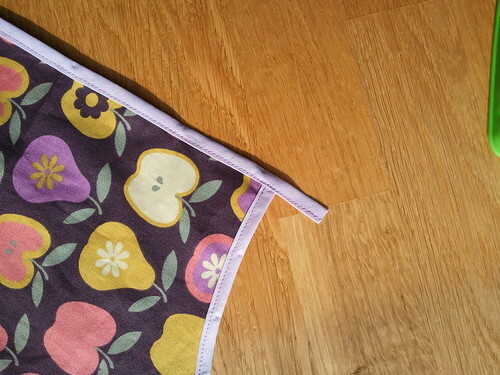 It was a bit tricky to get the corners rounded nicely, but it was a fun challenge. 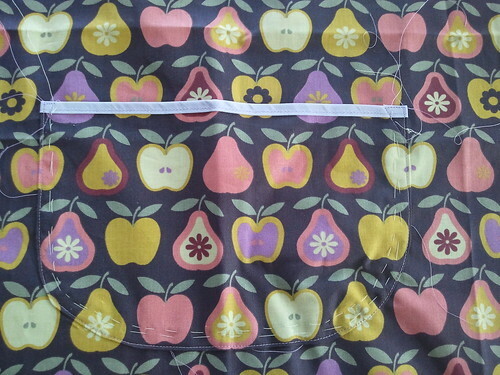 Then I had to match the pattern on the pocket to the pattern on the apron front. 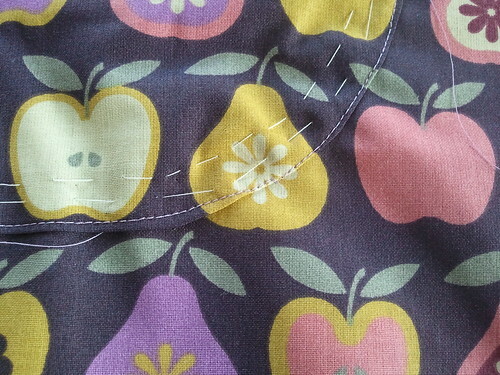 I still have to take the basting stitches out, and I must admit that sewing in a consistent distance to a rounded edge is not easy. I guess I will have to practice that a lot more. 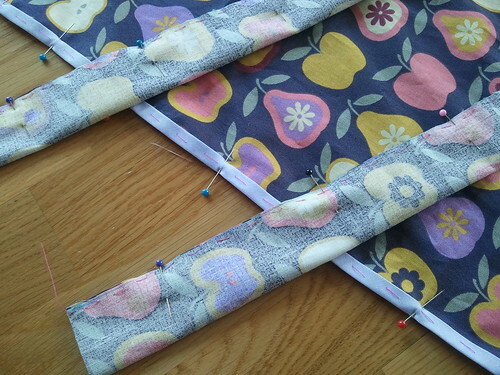 Next is to bind the whole edge of the apron. 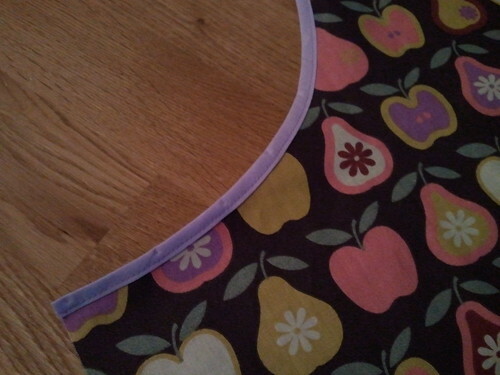 It has a curved edge too, so wish me luck! 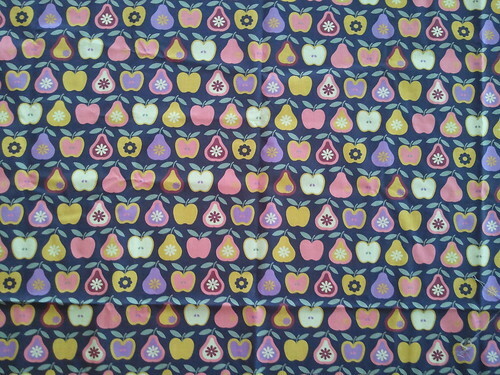 I think it’s perfect for an apron. 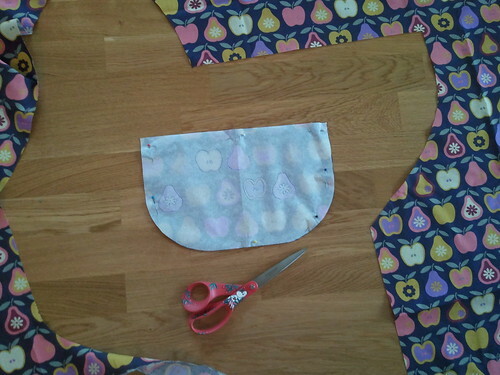 My extra challenge with this project is to align the front pocket so the pattern match! 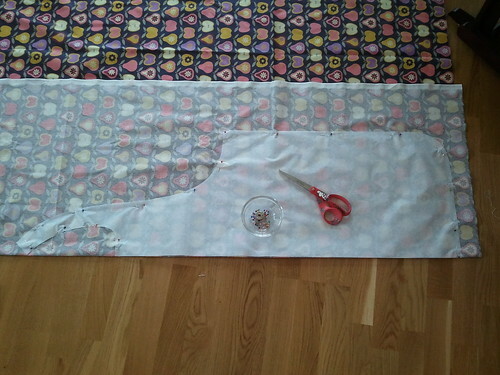 I found it a bit daunting cutting the fabric, but I think I did just fine, look…. 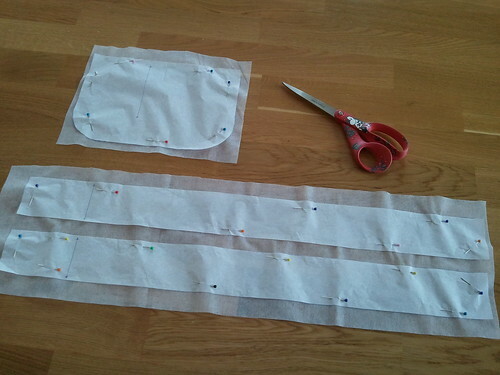 I cut from the front of the fabric to make sure I got the pattern sequence that I want. 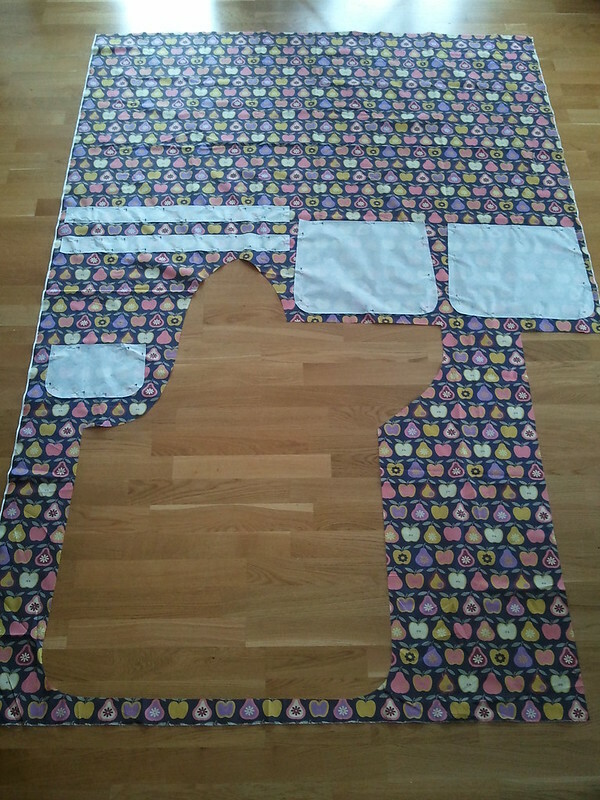 Still a lot of sewing to do, but that will have to wait for another day and another one of the baby’s naps. 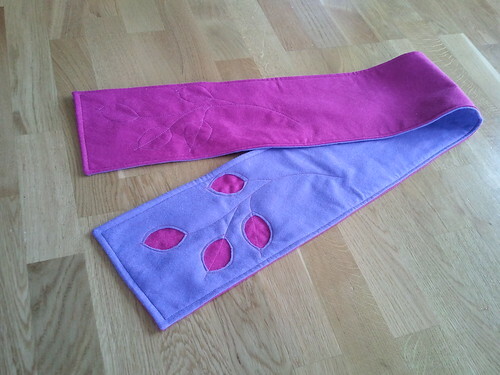 Embellished scarf – a finished project! 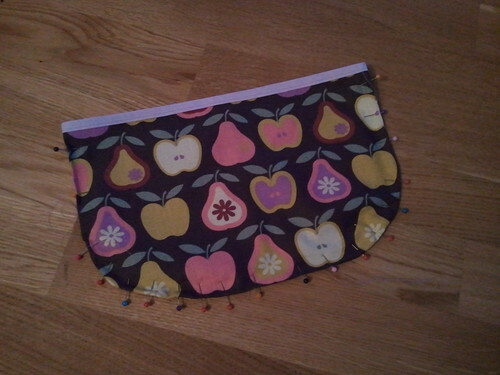 My second learning-how-to-sew project is finished! 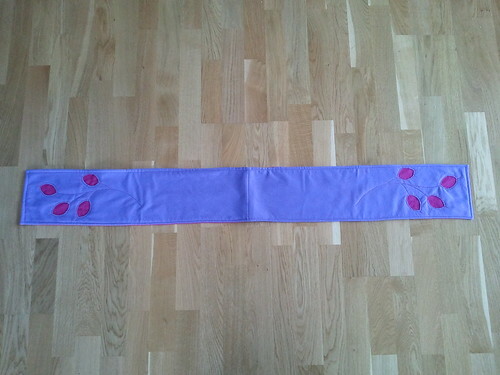 I used a chalk to trace the pattern on the other end of the scarf. It did not look nice when I used a ball point pen on the first end. 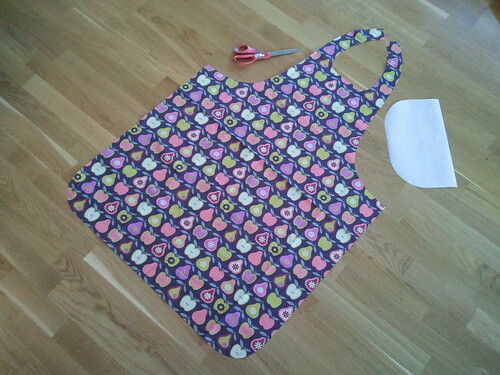 The next project in the book is an apron!